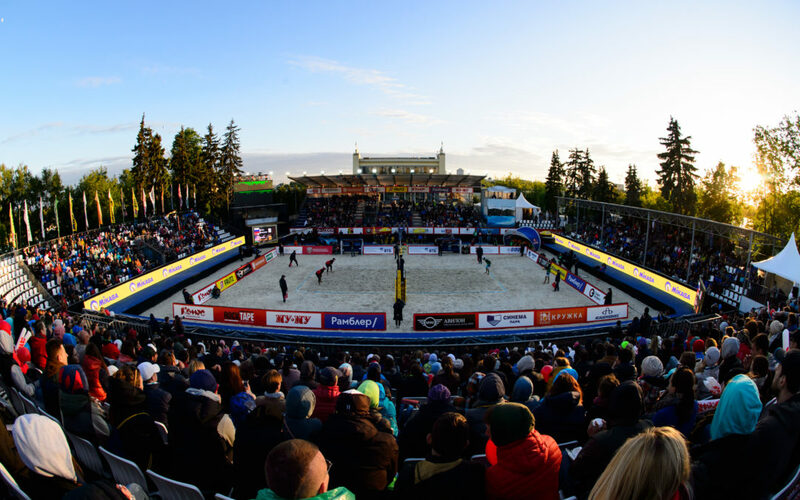 The annual beach volleyball events in the Russian capital of Moscow have been a trademark for quality in the past few years. The 2017 edition saw the American veterans Nick Lucena and Phil Dalhausser prevail in three ecstatic sets over the home favourites Nikita Lyamin and Vyacheslav Krasilnikov (21-17, 22-24, 18-16). 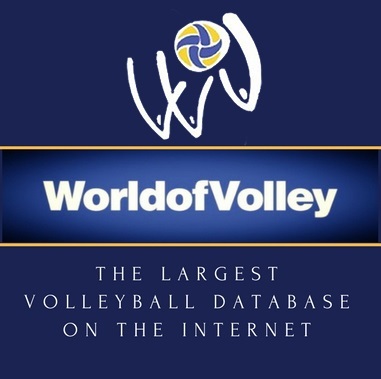 Formerly part of the World Tour’s Grand Slam elite, the Moscow event, now degraded to a 3-star Open following the new FIVB international structure, has been host to some of the most remarkable gold medal matches. In 2014 the Russians Semenov-Krasilnikov defeated in straight sets (23-21, 21-17) Poland’s Fijalek-Prudel. In 2015 Moscow witnessed Spain’s Herrera-Gavira’s technical display that won them the gold versus the Brazilians Pedro-Evandro (21-19, 21-19). And if you think that the 2016 final between Nummerdor-Vaarenhorst and Alison-Bruno, a repetition of the 2015 World Championship final, marks the highlight in the Russian capital, this past weekend’s ultimate encounter between Russia and USA could easily challenge last season’s masterpiece. Both Lucena and Dalhausser continue to defy the laws of physics and age. The Americans showed stamina and nerves of steel in order to win the tie-break in front of a frenzied local crowd. Well, the attendance could have been higher had it not been for the unpleasant weather for beach volleyball (12° C), but even so Lucena-Dalhausser had to play as guests in the final. They had only dropped a set throughout the entire tournament before stepping on the center court on Sunday evening. Targeting Nikita Lyamin from the service line in the opening set, the US team was lucky that Krasilnikov missed a break point opportunity at 9-11, thus leaving the cushion at just one point for the Russians at the technical time-out. Lyamin struggled with the reception and eventually the Americans took advantage of that. 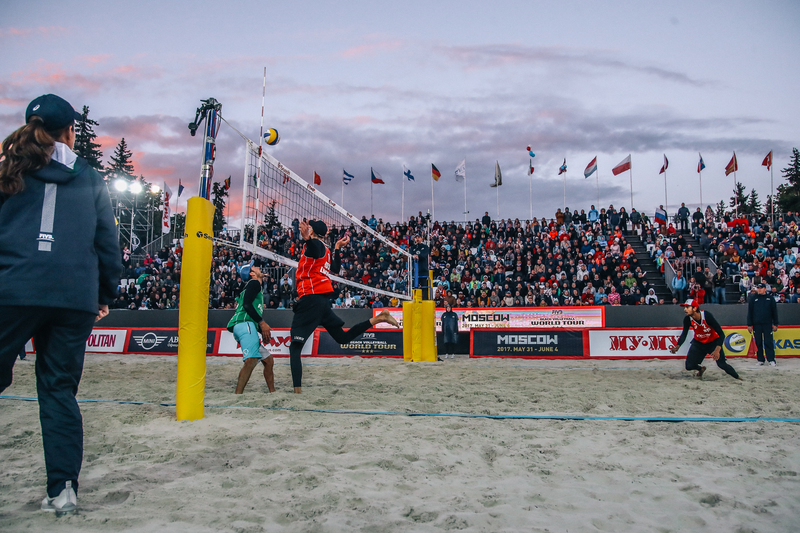 Two mistakes by Krasilnikov, targeted more by the Americans in the second set, increased the margin by 3 points for USA (11-14 and 12-15) and it looked like the chilly beach volleyball evening in Moscow was about to reach its conclusion. Krasilnikov, however, one of the Tour’s best and most energetic defenders, finished the next few rallies in great style and the score was at par. In a thrilling exchange of points, Lyamin-Krasilnikov pushed their opponents to the wall and managed to extend the match to a decider thanks to consecutive unforced attack errors by Lucena and Dalhausser. The tie-break could’ve been won by either side, but it was Phil Dalhausser with a major contribution from the service line and then at the net that helped team USA come back from behind and win the match. Lyamin-Krasilnikov were almost knocked out of the tournament in the preliminary pool after they lost their opening match against Norway’s Sorum-Mol. The new group formula, first introduced this campaign and implemented in the 3-star events, required only four pool matches instead of the usual six, which meant that that losers of the two so-called group “semifinals” would meet in a win-or-die match for a position in Round 1. Hence, Lyamin-Krasilnikov faced one of the Tour’s toughest and most consistent teams, the Poles Losiak-Kantor, who also suffered a shocking defeat against countrymen Rudol-Szalankiewicz. Lyamin-Krasilnikov prevailed over Losiak-Kantor in three sets (21-15, 19-21, 15-12) and went on to winning against Evandro-Andre from Brazil, Doppler-Horst from Austria, the already mentioned Rudol-Szalankiewicz from Poland, and the 3-time and reigning World Tour winners from Latvia Samoilovs-Semdins for a place in the final. Krasilnikov, who formerly enjoyed a successful partnership with Konstantin Semenov, seems to have found a very suitable new teammate in Nikita Lyamin, former indoor player, as they appeared in a second final in 2017 already, following their win at the 3-star Kish Island Open in Iran. There were Russians in the bronze medal match as well. Having trailed by a set, Oleg Stoyanovskiy and Artem Yarzutkin sensationally defeated Aleksandrs Samoilovs and Janis Smedins (18-21, 21-14, 15-8). Stoyanovskiy-Yarzutkin repeated their position from the Kish Island Open earlier this season. Go wild promo code could be interesting for you if you want to have some fun in casino.